We were scheduled to leave Buffalo at 6:55 p.m., and arrive in Toronto at 9:25. It was a Monday night. Traffic wasn’t too bad. It was sunny and windy after some weekend storms. Driving conditions were fine. Things should have gone fine. We got to Buffalo’s downtown bus terminal a half-hour before our departure time, and there was already a hefty lineup for the bus. Not unusual, I figured; it was the same coming here from Toronto. We waited in line while the two allotted Toronto-bound buses filled up with passengers and left well before 6:55 p.m. There were still maybe 20 of us in line, waiting. A friendly balding man in a Greyhound bus uniform assured us that a third bus would be added to accommodate us. By the time it showed up, the lineup had grown. By the time we left, it was 7:40. But, okay, it’s just a little delay. No big deal. We were heading toward the border, past Buffalo’s Coca-Cola field, where we’d seen the Buffalo Bisons AAA baseball team lose an exciting game a few days before. We passed the skyline of the city’s beautiful Art Deco city hall and miniature Statues of Liberty topping the industrial-era skyscrapers. 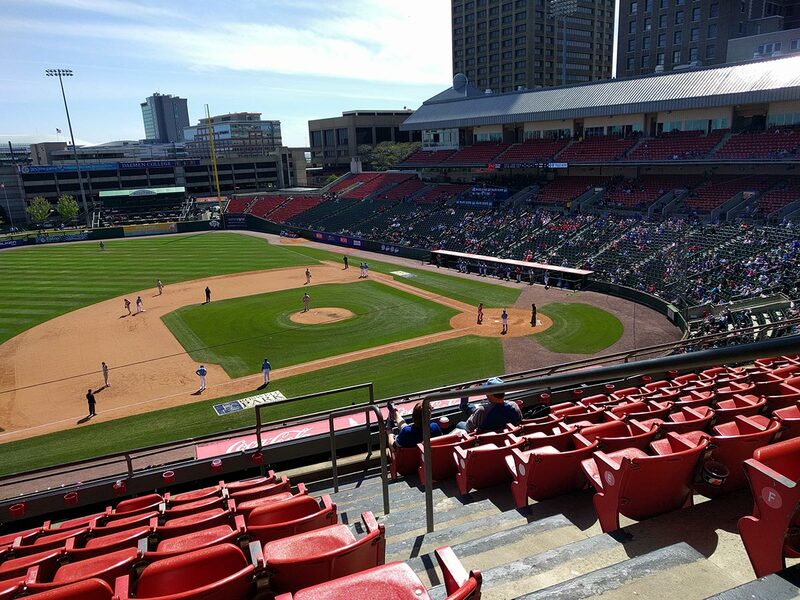 Buffalo’s Coca-Cola field from the cheap seats. As we approached the Peace Bridge to Canada, our driver, a young woman who at this point had still yet to collapse into a fuming pit of exasperated depression, pulled into the Duty Free lane behind several 18-wheelers. She opened the door and asked someone if she needed to be in this lane. “Do you need to check your Duty Free items?” asked the man from the doorway. This was our first hint that something was wrong. We pulled out of the Duty Free line (no, she learned, it’s not meant for Greyhound buses) and crossed the Buffalo River, reaching the border behind a lineup of several other buses by around eight o’clock. After another half-hour of waiting and occasionally inching toward customs, our driver stood up. None of us stood up. I asked, “What questions?” but she didn’t hear me and stepped off the bus. The couple in front of us—the guy was wearing a #ParkdaleLife hat, revealing his downtown Torontoness—laughed nervously. Our driver stepped off the bus and found someone who presumably knew how to handle the situation. She didn’t say anything else to us until we arrived, at which point she instructed us to remove all our belongings from the bus and line up inside the office. My American wife and I bolted out, because her application for Canadian permanent residence was processing and we anticipated getting held up. Sure enough, the customs officer quizzed us and led us into a back room, where we sat, hearts thumping loudly against our chests, for 20 minutes while everyone else got back on the bus and our driver began walking around, looking for us, the missing passengers. When the customs officer called us up, we politely answered his questions. But border crossings are always nerve-wracking at the best of times, depressing at the worst, and with each question he asked, we did our best to answer clearly, avoiding the quiver in our throats. In an ecstatic haze, we jogged out the door and boarded the bus, ready to get back to our seats and talk about our future. Except we couldn’t do that, because two girls were sitting in our seats. Actually, people were sitting in virtually every seat. All but one. My wife sat down in it while I double-checked the maximum-occupied back of the bus. This confused me, but it was mind-boggling for our driver, who, after I told her, stood at the front and yelled, “Whoever is not supposed to be on this bus, please get off. One of you belongs on Megabus.” She then walked up and down the aisle, beginning what turned into a very Canadian McCarthyist witch-hunt for the one person who snuck on this bus. Everyone insisted they belonged, though—they’d bought a ticket, and could vouch for their seat neighbours and family members. I asked the driver why not just check the tickets. “I don’t have time for that,” she said, less snappy than tired. “I’ve got to get this bus moving.” It was now 8:45. In a bit of improvisational genius that worked for everyone except the Canadian customs agents, our driver convinced some random man to voluntarily take the next bus to Toronto (it was behind us) and I sat down in his seat. But immediately a stern, bald-headed border agent confirmed that, no, we could not simply allow some stranger on a bus and deliver them to downtown Toronto. So for the next 30 minutes she read out all the names, growing ever angrier when people didn’t hear her quiet voice or recognize their badly mispronounced names. 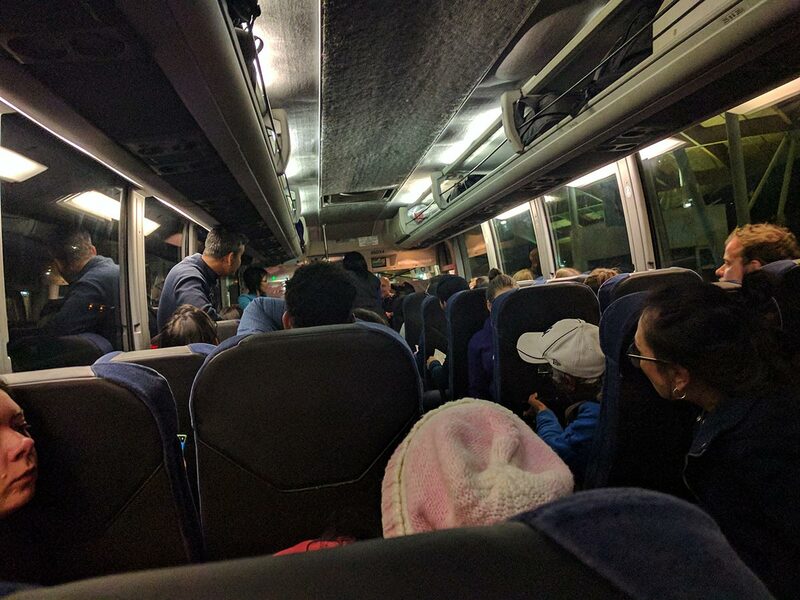 We immediately knew the system wasn’t going to work—Greyhound employees at the terminal had handed out random tickets to people who switched to this bus from different ones, creating a messy web of mismatched IDs and mystery tickets. Some people had the right names but different ticket times; others had the wrong names printed deliberately. What we learned was that everyone, regardless of their ticket name or scheduled departure time, had a Greyhound ticket. My wife turned back toward me, 15 rows ahead, and glared. So much for that moment of happiness. “Has it occurred to anyone,” I quietly asked the Irish man beside me, “that maybe the problem isn’t a human one, but an institutional one? Maybe the system is broken and we’re just sitting here, suffering for no reason?” The Irish man—who lost his Canadian permanent-resident card during a Las Vegas bachelor party, shipped all his clothes back to Toronto and so had to buy an expensive last-minute flight to Buffalo to cross into the country by land, wearing just shorts and a summer shirt, with no bags whatsoever, and now had to endure this horror show—agreed with me. The bus finally started moving at 10 p.m., 35 minutes after our scheduled arrival time. When we reached the final border checkpoint, we stopped again. We reversed a little. The driver stood up, reached for her bag and drove us 20 more metres before pulling over and turning on all the lights. Immediately there were rumours, groans and manic laughter. None of us in the back knew what had happened—did she leave the luggage doors open, and all our bags flew out? Is she squatting for a pee on the side of the road? Did she just quit? Nope. She just forgot her license.